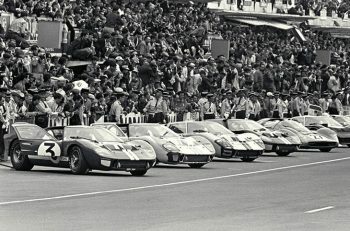 David Greenhalgh is a professional lawyer, and has written in his native Australia about the Le Mans disaster of 1955. In the following article, he examines what happened, looks at how things have changed and gives us his insight into the way such events might be investigated more than fifty years later. Anybody with an interest in the history of sports car racing will have a basic knowledge of the disaster at Le Mans in 1955. Most of those people will also have (probably very strong) views on who, if anyone, out of Mike Hawthorn, Lance Macklin, Pierre Levegh and the ACO were to blame for the accident. But there are aspects of the disaster which have received very little consideration over the years – and which would almost certainly have changed our perception of the accident. Before we turn to them, the facts and the main arguments for and against the key players will be briefly set out. At 6.26pm, Mike Hawthorn (Jaguar D Type), who had been engaged in a titanic duel with Juan Manuel Fangio (Mercedes 300SLR), was making his first pit stop. After leaving White House, he pulled to the right of the track to slow down. In doing so, he drove in front of Lance Macklin (Austin Healey) who then swerved to his left to avoid the Jaguar. This put Macklin into the path of Pierre Levegh (Mercedes 300SLR), who launched off the back of Macklin’s car and into the crowd with appalling consequences. Levegh was killed, and it is usually said that around 82 spectators were also killed as the car disintegrated. The police files have never been released, and there is a suspicion that the true death figure was much higher: for instance, in The Certain Sound, John Wyer put it at 130. By any standards it was a major disaster, the effects of which are still felt today (see for instance my interview with Bernd Schneider last December). The ACO decided to let the race run to completion. In the small hours of Sunday morning, the remaining two Mercedes were withdrawn while the Fangio/Moss car was well in the lead. Hawthorn and co-driver Ivor Bueb went on to win. The critics of Hawthorn say that it was up to him to safely lap Macklin; that he must have had sufficient time to properly consider the position as he left White House; and that he simply didn’t leave Macklin (with much poorer brakes than the Jaguar) room to easily avoid him. He also had the most time of the three to make his decision, and was under the least pressure when he did so – yet that decision bequeathed Macklin and Levegh a situation where they had very little time to make their own choices, and had to do so in a state of emergency. The defenders of Hawthorn, however, say that he signalled his intention by raising his arm; that Macklin could and should have got around him safely; and that he generally didn’t do anything out of the ordinary from general racing practice. The critics of Macklin say that either he looked too long in his mirror at the two Mercedes (Fangio was right behind Levegh) before looking ahead at the back of the Jaguar or alternatively that he was looking ahead at all times but misjudged the distance. Either way, the critics say that he could have eased his way around the Jaguar, instead of going into a slide which put him well onto Levegh’s side of the road. The defenders of Macklin say that he should never have been put in such a tricky position in the first place, that he did everything he could to stop in the available space, but at the last moment when he realised he was going to rear-end Hawthorn, he had no option but to swerve to the left. The critics of Levegh say that he was too old (49) to be driving such a potent car, that his lap times in earlier tests showed him to be ill at ease in the 300SLR and that in any event he was already being lapped. Further, he had enough road width to avoid Macklin. The defenders of Levegh say that he was a competent operator, especially at Le Mans. 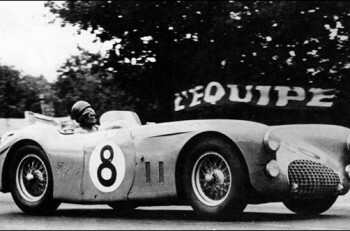 He had lapped faster than all but two of the works Jaguar drivers and was driving to a race pace set by Mercedes Above all, he simply had nowhere to go – as the track was kinking slightly to the right, it was impossible for Levegh to hold hard to the left of the road. Critics of the ACO say that the road leading to and passing the pits was too narrow, an opinion previously aired by some drivers. Defenders of the ACO say that the track was typical of the time, and that the metre-high embankment should have been enough to stop any wayward car. Most of those arguments have been advanced on the back of a series of still photos of the accident unfolding: to study them is all very detached and analytical. But when John Matthews “Bigger Picture” company released The Deadliest Crash DVD in 2009, with staggering head-on footage of the accident occurring and Levegh rearing up straight at the photographer, the overwhelming sensation is of how quickly it all happened. Leaving aside the actual mechanics of the accident, there are three big underlying themes running very strongly through all these arguments, which to me is why the event is so interesting. The first is political. It was only ten years since the end of a very violent war, and Mercedes was strongly identified with Germany (even today, there is a panel in the Mercedes museum in Stuttgart apologising for the company’s involvement with the Third Reich…) The marque’s 1-2 at Le Mans three years earlier had been rather less than popular, and one of the reasons the company decided to withdraw from the 1955 race was to avoid the look of racing to victory over the bodies of dead Frenchmen. The shadow of the War falls all over the events in 1955. The second, closely related, issue is public relations. These days, many people regard the presence of the PR hordes as far too pervasive in the sport, so it is instructive to see how it was done back in those days. The Mercedes board asked itself how it would look if they won the race, but that crucial question never seems to have occurred to the Jaguar interests on the ground: team manager “Lofty” England never referred back to the company in England for instructions, and even if he did, it is by no means certain that the approach would have been any different. The team’s handling of Hawthorn also left much to be desired. He clearly lost his nerve in the immediate aftermath of the accident, and many of the reports say it was England who steadied him sufficiently to allow him to drive on to victory. However, those reports are silent as to how it was that England let Hawthorn behave in such a crass and insensitive manner when he won the race, not surprisingly leading to bitterly caustic comments in the French press and aggravating an already (albeit self-inflicted) difficult PR position for Jaguar. Of course, with the help of England and others getting in his ear, Hawthorn had by then concluded that his initial reaction – that the accident was all his fault – was wrong. And he said as much in his autobiography Challenge Me The Race in 1958. And that brought to a head the third big issue underlying the accident: the threat of litigation. It was an extraordinary assertion, which needs to be taken with whole spoonfuls, rather than mere grains, of salt. But presumably – although the books do not mention it – the ACO and its insurer had their hands full with a much more realistic problem, namely claims from members of the public. It would be fascinating to know how those claims were handled. It is however known that Mercedes made a voluntary payment to the affected families, though the two main authors differ wildly on the point: Kahn says Mercedes paid £100,000 (about £2.25m in today’s money) while Hilton says it paid one million francs. In the mid-1950’s, there were 980 francs to one British pound, which means that Hilton is saying that Benz paid only £1,020. One or both of the authors has therefore got this point very badly wrong. For his part, Macklin was not insured, and was worried about his potential exposure. And with the Jaguar interests all carefully backing Hawthorn’s version of events, it would be very surprising indeed if the possibility of litigation hadn’t crossed the minds of one or two people in Coventry. For their part, the drivers also did their best to avoid litigation by reaching a more or less implicit agreement to avoid attacking each other at the post-race inquiry conducted by Judge Zadoc-Kahn: in the face of possible involuntary homicide charges, the drivers’ aim, helped by the imposing figure of World Champion Fangio, was to portray it as a racing accident. Macklin later described this inquiry as a farce, as the drivers were “very muted”, obviously in the hope that the whole thing would blow over. That being so, it remains very surprising that Macklin then took the enormous risk of suing Hawthorn for libel, after Macklin took Hawthorn’s book to suggest that Macklin had caused the accident. The action was shelved when Hawthorn died in January 1959, but it leads to the tantalising possibility that our whole understanding of the accident would have been clarified by these proceedings. It is hard to see how the libel action, had it gone to hearing, would have been anything other than a comprehensive inquiry into the accident. My research indicates that the Zadoc-Kahn inquiry certainly heard evidence – but there does not appear to have been any cross-examination. And that is the crucial issue. In the libel case, Hawthorn would have faced a terrible time in cross-examination by Macklin’s barrister. I can say from my own experience as a litigation lawyer that anyone who says, straight after an accident, that “it was all my fault” faces a massive hurdle to try to convince a judge that this first assessment was wrong. The vast majority of witnesses get themselves in an awful tangle trying to extricate themselves from the initial admission. I strongly suspect Hawthorn would have been no different. Hawthorn’s counsel, on the other hand, would have had a much more difficult time cross-examining Macklin, who was clearly going to say, on oath, that he had not been looking in his mirrors after Hawthorn passed him; that he was at all times looking forward at the Jaguar; and that he simply didn’t have the time or space to swerve gently enough to avoid getting in Levegh’s way. The judge was always going to believe that Macklin kept looking ahead, because there would be no possible evidence to contradict him, while the assertion that he had the time and space for a gentle swerve is likely to have come down to analysis of eyewitness statements, measurements and films. Even if Macklin succeeded in persuading a court that Hawthorn left him no option but to swerve into Levegh’s path, he still may not have won the case. Hawthorn’s comments in his book were very vague, and even if they could be interpreted as blaming Macklin, it may not have been enough for Macklin to establish the legal points required to prove he’d been libelled. But the evidence about the actual accident would have been there for all to see, such that our whole view of the disaster would have been changed forever. It is almost certain that many theories about the accident would simply not have survived the court case. The ramifications of the accident were widespread; some countries banned motor sport temporarily or permanently. And it is safe to say that such an accident would be an even bigger problem today than in 1955. In those days, there was some chance of successfully arguing it was just a “racing accident” – although that thin veneer was going to be shattered by Macklin’s court case in any event. These days, in a society with a far greater sense of entitlement, there would be no chance at all of running that argument. Not only would there be widespread litigation, but Sir Jackie Stewart is on record as saying the sport itself may not survive another disaster of such proportions. In reality, even at the time, the disaster was far more significant than a mere “racing accident”. The scope of the issues called for a wider perspective: some of the key decision-makers on the day had the insight to realise that fact, while others did not. There will be other times when the sport will need a similar sense of perspective – and we are probably in such a time now. Motor racing will come under increasing public attack as being a wasteful use of resources. And just as in 1955, some people in the sport will take a narrow, insular approach to the problem, while others will recognise the true extent of the threat. Fortunately, the sport will have a lot more time to consider its position today than did those unfortunate drivers, team members and race officials in 1955. But the echoes and lessons of that dreadful day are there for all to heed.